Monoceros constellation lies in the northern sky, on the celestial equator. Its name means “the unicorn” in Latin. Monoceros was introduced by the Dutch astronomer and cartographer Petrus Plancius from the observations of Dutch navigators in the 17th century. The constellation represents the mythical single-horned, horse-like creature. Monoceros is a relatively faint constellation, containing only a few fourth magnitude stars, but it is nevertheless home to several notable stars: the famous variables S Monocerotis, R Monocerotis, and V838 Monocerotis, Plaskett’s Star, which is one of the most massive binary stars known, and the triple star Beta Monocerotis. Monoceros also contains several interesting deep sky objects: the open cluster Messier 50 (NGC 2323), the Rosette Nebula, the Christmas Tree Cluster, the Cone Nebula, and Hubble’s Variable Nebula, among others. Monoceros is the 35th constellation in size, occupying an area of 482 square degrees. It is located in the second quadrant of the northern hemisphere (NQ2) and can be seen at latitudes between +75° and -90°. The neighboring constellations are Canis Major, Canis Minor, Gemini, Hydra, Lepus, Orion and Puppis. Monoceros belongs to the Orion family of constellations, along with Canis Major, Canis Minor, Lepus and Orion. Monoceros contains one Messier object – the open cluster Messier 50 (NGC 2323) – and has 16 stars with known planets. The brightest star in the constellation is Beta Monocerotis, with an apparent magnitude of 3.76. There are two meteor showers associated with the constellation: the December Monocerids and the Alpha Monocerids. Monoceros first appeared on a globe by the Dutch cartographer and clergyman Petrus Plancius in 1612 as Monoceros Unicornis. The constellation was created to fill the area between two large constellations, Orion and Hydra, where there weren’t any constellations introduced in Greek times. Plancius introduced the unicorn figure because the mythical animal appears several times in the Old Testament of the Bible. The constellation is not associated with any particular myth. The German astronomer Jakob Bartsch included the constellation in his 1624 star chart as Unicornus. Alpha Monocerotis is the brightest star in Monoceros. It is an orange giant with the stellar classification of K0 III. It has an apparent magnitude of 3.94 and is approximately 144 light years distant from the Sun. The star has a mass 2.02 times that of the Sun and a radius 10.1 times solar. Gamma Monocerotis is the second brightest star in the constellation. It is another orange giant, belonging to the stellar class K1.5III. The star has an apparent magnitude of 3.98 and is approximately 645 light years distant from the solar system. It is the primary star in a multiple star system. Delta Monocerotis is a white main sequence star with the stellar classification of A2V. It has an apparent magnitude of 4.15 and is about 375 light years distant from the Sun. It is the third brightest star in Monoceros. Zeta Monocerotis is a massive, luminous, yellow supergiant star in Monoceros. It belongs to the stellar class G2Ib. It has a visual magnitude of 4.37 and is approximately 1,852 light years distant from Earth. The star lies about three quarters of a degree from the border with Hydra constellation. It is 2,535 times more luminous than the Sun and has a radius 62 times solar. Epsilon Monocerotis is a double star approximately 128 light years from Earth. It has an apparent magnitude of 4.31. The primary component in the system is a white, class A5 subgiant star with an apparent magnitude of 4.44, and the companion is a yellow-white main sequence dwarf of the spectral type F5, with a visual magnitude of 6.72. The two components are separated by 12.1 arc seconds. They have luminosities 20 and 2.5 times that of the Sun, radii 2.2 and 1.2 times solar, and masses 1.9 and 1.25 times that of the Sun. The primary component is a very rapid rotator, with a projected rotational velocity of 137 km/s. The two stars have an orbital period of at least 6,000 years and are at least 500 astronomical units apart. The brighter star has a dim, line-of-sight companion. Epsilon Monocerotis lies just to the west of the famous Rosette Nebula, one of the best known diffuse nebulae in the sky. 13 Monocerotis is a white supergiant star belonging to the stellar class A0Ib. It has a visual magnitude of 4.47 and is approximately 1,509 light years distant from Earth. It is about 10,800 times more luminous than the Sun, has a radius 37 times solar, and a mass about 9 times that of the Sun. Like Epsilon Monocerotis, the star serves as a gateway to the Rosette Nebula, which is located a few degrees to the south. 13 Monocerotis originated from the cluster NGC 2264, which lies 3.5 degrees to the northeast of the star. 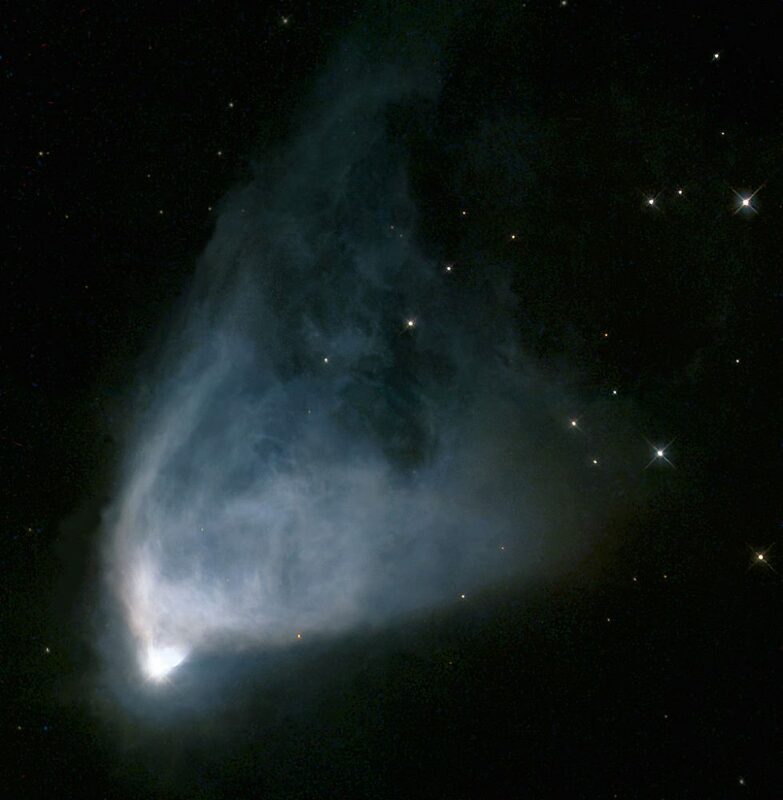 The star appears to be surrounded by a faint reflection nebula as a result of its light being scattered off interstellar dust in an area spanning over 10 light years. Beta Monocerotis is a triple star system in Monoceros. It cannot be resolved into individual stars without binoculars. The system has a combined apparent magnitude of 3.74 and is approximately 700 light years distant from Earth. It is the brightest visible star in Monoceros. All three components – Beta Monocerotis A, B and C – are Be stars, which is to say, B-class stars with circumstellar disks orbiting them. There is also a fourth companion, a 12th magnitude star, visible nearby, but it is a line-of-sight companion and not physically related to the Beta Monocerotis system. The three stars in the system are remarkably similar. They all belong to the spectral class B3 and have temperatures around 18,500 K. They are all hydrogen-fusing dwarfs. They have masses 7, 6.2 and 6 times solar, and apparent magnitudes of 4.6, 5.4, and 5.6. Beta Monocerotis A is 3,200 times more luminous than the Sun, while components B and C have 1,600 and 1,300 solar luminosities. Their projected rotational velocities are 346, 123, and 331 km/s, which is why they all have circumstellar disks. S Monocerotis is a massive variable spectroscopic binary system in Monoceros. It consists of two stars that cannot be resolved, that orbit each other with a period of 25 years. The system has the stellar classification of O7Ve, matching the spectrum of an O-type main sequence dwarf. Its visual magnitude varies from 4.2 to 4.6. The system is approximately 1,000 light years distant from Earth. S Monocerotis is positioned in the Christmas Tree Cluster in NGC 2264, and is surrounded by the nebula Sharpless 273. It falls just to the north of the Cone Nebula. HD 49933 is a yellow-white dwarf belonging to the stellar class F2 V. It has an apparent magnitude of 5.781 and is approximately 97 light years distant from the solar system. The star is very similar to the Sun. It has 1.079 times the solar mass, a radius 1.385 times that of the Sun, and is 3.47 times more luminous. 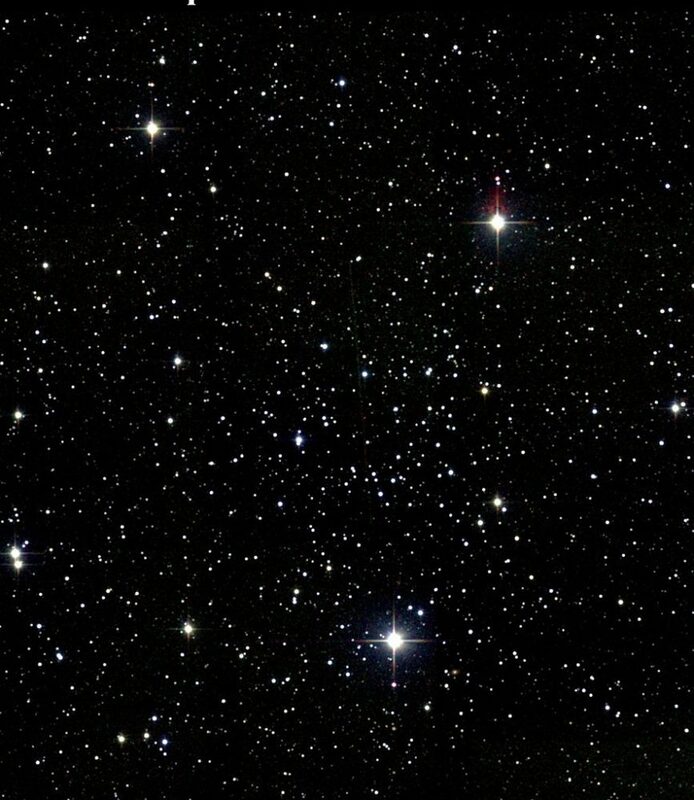 The star can be seen without binoculars in good viewing conditions. It has a companion with an apparent magnitude of 11.3, located at an angular separation of 5.9 seconds of arc. The star’s estimated age is 2.4 billion years. Plaskett’s Star is a spectroscopic binary star system named after the Canadian astronomer John Stanley Plaskett, who discovered that it was a double star in 1922. The system has an apparent magnitude of 6.06 and is approximately 5,245 light years distant from Earth. It consists of two massive, blue O-type supergiant stars. The primary component belongs to the stellar class O8 and the companion has the classification of O7.5. Plaskett’s Star is one of the most massive binary systems known, along with Eta Carinae in Carina constellation. It has a total mass about 100 times that of the Sun. The components have an orbital period of 14.39625 days. The dimmer star in the system is a very fast spinner. It has a projected rotational velocity of 300 km/s and, as a result, it has a bulge at the equator. HD 52265 is a yellow main sequence dwarf belonging to the stellar class G0V. It has an apparent magnitude of 6.301 and is approximately 91.50 light years distant from the Sun. The star is twice as luminous as the Sun and has 18 percent more mass. It has an estimated age of about 4,000 million years. An extrasolar planet was discovered orbiting the star in 2000. The planet has 1.09 times the mass of Jupiter and an orbital period of 119.290 days. Gliese 250 is another binary star in Monoceros. The components have apparent magnitudes of 6.57 and 10.08. The primary component is an orange dwarf with the stellar classification of K3 V, and the companion is a red dwarf belonging to the stellar class M2.5 V. The stars are separated by 58 seconds of arc, or about 500 astronomical units. Gliese 250 is only 28.4 light years distant from Earth. HD 48099 is another massive O-type star in the constellation. It has a visual magnitude of 6.37 and is approximately 40,750 light years distant from the Sun. This means that the star has an absolute magnitude of -9.11 and is at least 350,000 times more luminous than the Sun. HD 48099 is really a close binary system with an orbital period of 3.078 days. The components are believed to belong to spectral classes O5.5 and O9. HD 44219 is a yellow, class G5 main sequence dwarf with an apparent magnitude of 7.705. It is about 164 light years distant from Earth. The star has 99 percent of the Sun’s mass and 1.39 times the radius. It is 1.793 times more luminous than the Sun. A gas giant was discovered orbiting the star in 2009. The planet has about 50 percent of Jupiter’s mass and completes an orbit around the star every 472.3 days. HD 46375 is located in the foreground of the cluster NGC 2244 in the Rosette Nebula. It is an orange subgiant star with an apparent magnitude of 7.84. It has the stellar classification of K1 IV and is approximately 114 light years distant from the Sun. A gas giant with only 0.226 times the mass of Jupiter was discovered orbiting the star in 2000. The planet has an orbital period of 3.023573 days. 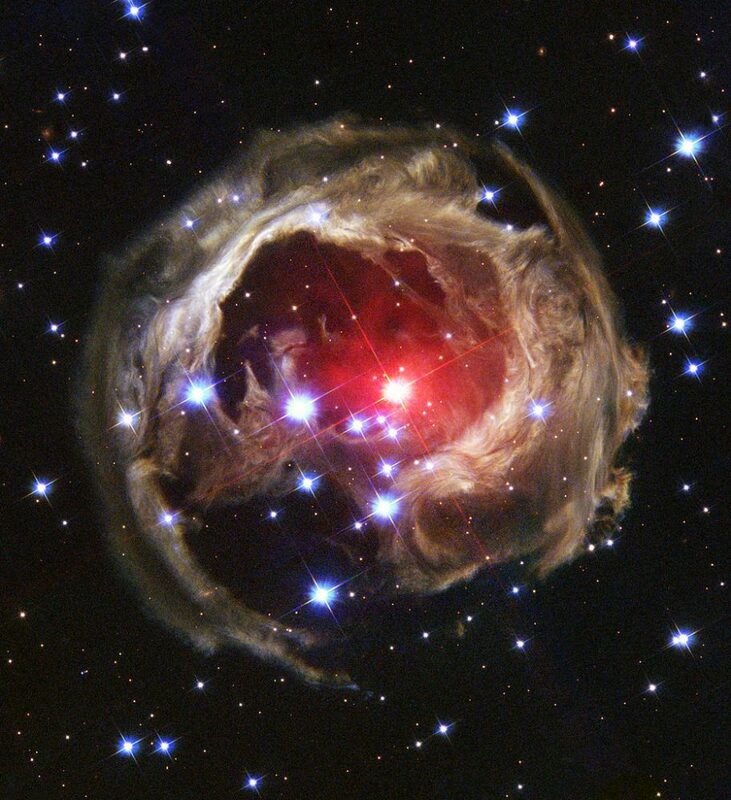 R Monocerotis is a T Tauri type variable in Monoceros. T Tauri stars are young, pre-main sequence stars generally found near molecular clouds that have strong chromospheric lines. The star’s apparent magnitude varies between 10 and 12. It is approximately 2,500 light years distant from the solar system and has a mean visual magnitude of 10.4. The star lies in Hubble’s Variable Nebula, a diffuse reflection nebula formed of the gas and dust fanning from the star. R Monocerotis has a smaller, dim companion. The bigger star has about 10 solar masses and is about 43,000 times more luminous than the Sun. Ross 614 a red dwarf star classified as a UV Ceti type variable, which means that it is a type of flare star. The star is the primary component of a binary system located only 13.3 light years from Earth. It has a visual magnitude of 11.15. The binary system consists of two red dwarfs belonging to the stellar classes M4.5V and M8V, in a close orbit. The companion star has a visual magnitude of 14.23. The brighter star was discovered by the American astronomer and physicist Frank Elmore Ross in 1927 using a 40 inch refractor telescope. The Dutch-American physicist and astronomer Dirk Reuyl was the one to detect the binary system in 1936 using a 26 inch refractor. COROT-7 is a yellow main sequence dwarf with an apparent magnitude of 11.668. It is approximately 489 light years distant from the Sun. It belongs to the stellar class G9V. The star has about 82 percent of the Sun’s radius and 91 percent of the Sun’s mass. Two extrasolar planets, both super-Earths, were discovered orbiting the star in 2009. There may be a third planet in the system, but it is unconfirmed. COROT-7b, the inner planet, has between 2.3 and 8.5 times the Earth’s mass and completes an orbit around the star in 0.853585 days. The planet COROT-7c has between 8.4 and 13.5 times the solar mass and an orbital period of 3.698 days. COROT-1 is a yellow main sequence dwarf belonging to the stellar class G0V. It has an apparent magnitude of 13.6 and is approximately 1,560 light years distant from Earth. 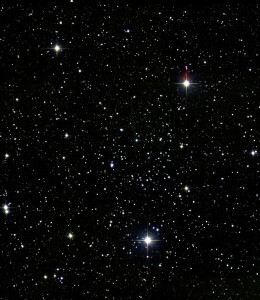 The star can be seen in a medium-sized telescope. A transiting exoplanet, a hot Jupiter, was discovered orbiting the star in 2007. The planet is believed to be tidally locked to the star, which means that one side of it always faces the star, in the same way the same side of the Moon always faces Earth. The planet has 1.03 times Jupiter’s mass and completes an orbit around the star every 1.5089557 days. V838 Monocerotis is a red supergiant and a famous variable star in Monoceros. It has the stellar classification of M6.3I. The star has an apparent magnitude of 15.74 and is approximately 20,000 light years distant from Earth. The star was discovered when it experienced an outburst and suddenly brightened for a few weeks in 2002, and was thought to be one of the largest stars discovered. The cause of the explosion is still uncertain, but it resulted in a light echo, with the surrounding dust being illuminated by the star’s light. The star grew enormously in size, but did not expel its outer layers, which is what would normally happen in nova explosions. The star has also increased in temperature and luminosity, but decreased in radius. It is now 15,000 times more luminous than the Sun and has a radius 380 times solar. Messier 50 is an open cluster in Monoceros constellation. It has an apparent magnitude of 5.9 and is approximately 3,200 light years distant from the Sun. Messier 50 – Atlas Image mosaic courtesy of 2MASS, UMass, IPAC-Caltech, NASA, NSF. The cluster, distinct for its heart-shaped figure, was discovered by Charles Messier in 1772 and subsequently included in his catalogue. The Rosette Nebula is a large emission nebula in Monoceros. It is an H II region positioned near a large molecular cloud. The open cluster NGC 2244 is associated with the nebula, as its stars have been formed from the matter within the nebula. 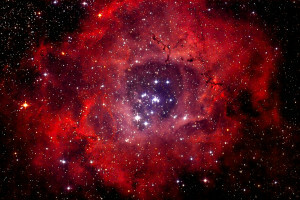 The Rosette Nebula has a visual magnitude of 9.0 and is about 5,200 light years distant. It is about 65 light years in radius. 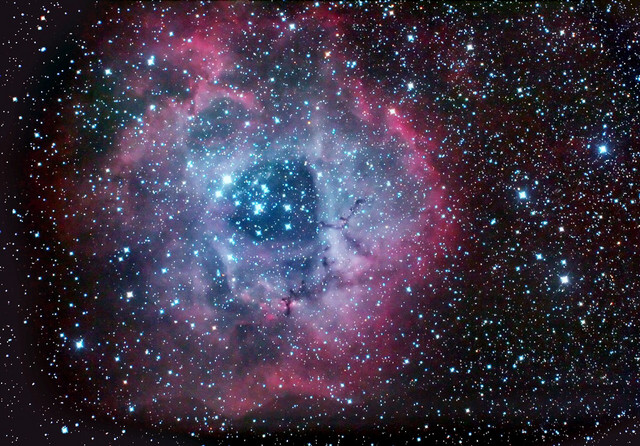 The Rosette Nebula complex has several NGC designations: NGC 2237, NGC 2238, NGC 2239, NGC 2244, and NGC 2246. All except NGC 2244 designate parts of the nebulous region, and NGC 2237 is also used to denote the entire nebula. 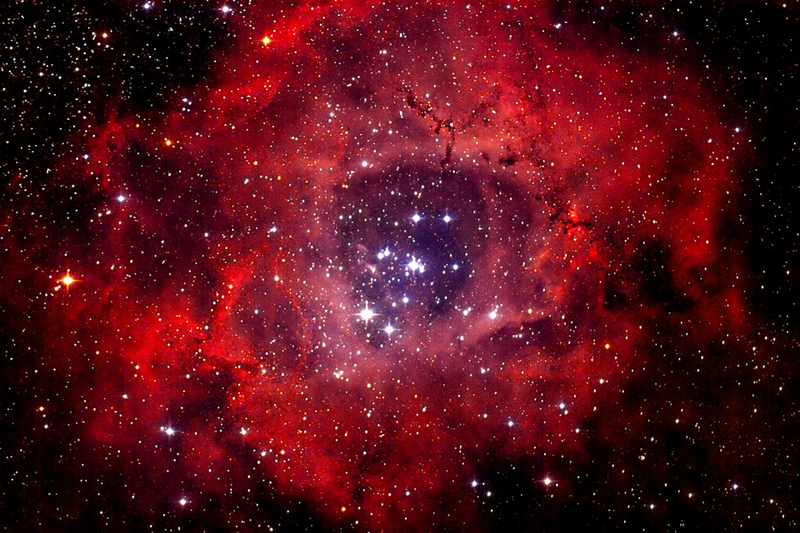 NGC 2244 is an open cluster located within the Rosette Nebula. It was discovered by the English astronomer John Flamsteed in 1690. The cluster contains several extremely hot, O-type stars that emit large amounts of radiation and generate stellar wind. The two brightest stars in the cluster belong to stellar classes O4V and O5V, have masses 50 and 60 times solar, and are 400,000 and 450,000 times more luminous than the Sun. The cluster is approximately 5,200 light years distant from Earth. It has an apparent magnitude of 4.8. The estimated age of the cluster is less than 5 billion years. 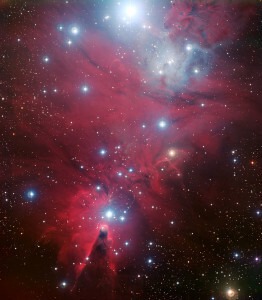 NGC 2264 is a New General Catalogue designation for two deep sky objects – the Christmas Tree Cluster and the Cone Nebula – and there are two other objects that fall within this designation, but are not officially included: the Snowflake Cluster and the Fox Fur Nebula. The Christmas Tree Cluster is an open cluster with an overall visual magnitude of 3.9. It is about 2,400 light years distant from the solar system. The star S Monocerotis marks the trunk of the Christmas tree, and another variable star, V429 Monocerotis, represents its top. 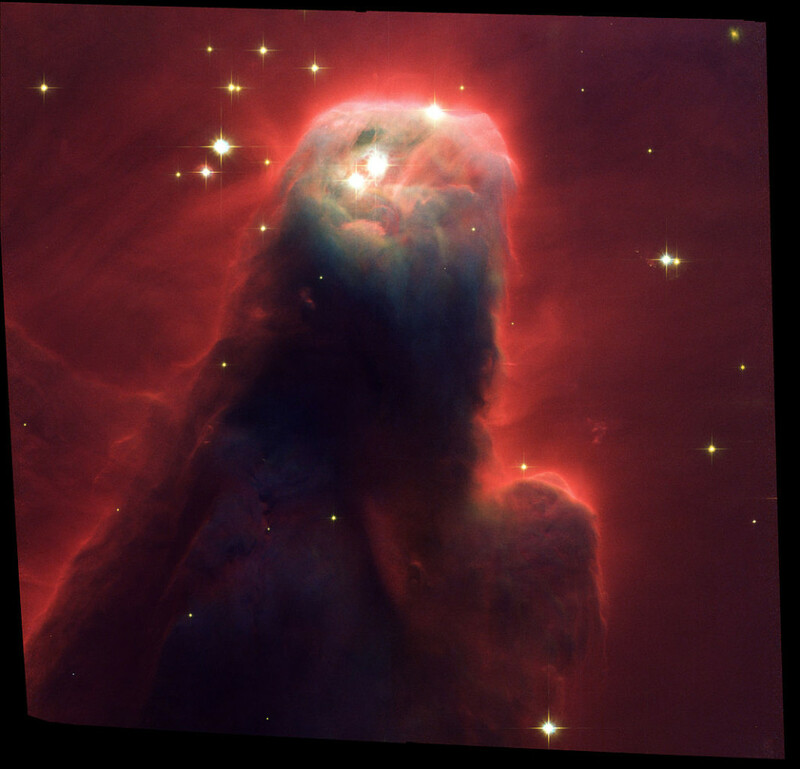 The Cone Nebula is an H II region in the southern part of NGC 2264, about 2,700 light years from Earth. It was discovered by William Herschel on December 26, 1785. It is part of the nebulous region around the Christmas Tree Cluster. The nebula is 7 light years long. The Snowflake Cluster is a cluster that resembles the pattern of a snowflake. It is about 2,400 light years distant from Earth. The Fox Fur Nebula is a diffuse dark nebula in NGC 2264, approximately 2,700 light years distant. It got its nickname because it resembles the head of a stone made from the fur of a fox. Hubble’s Variable Nebula is a variable nebula illuminated by the light of the star R Monocerotis. The nebula was imaged by the American astronomer Edwin Hubble on January 26, 1949. One of the explanations for the nebula’s variability is that its dense dust clouds periodically block the light of the central star, which is completely enveloped by the nebula and not visible itself. Hubble’s Variable Nebula has an apparent magnitude of 9.0 and is approximately 2,500 light years distant from Earth. NGC 2254 is an open cluster in Monoceros. It contains fewer than 50 stars, but appears to be fairly rich, and it is classified as a Shapley class f and Trumpler class I 2 p cluster. It has a visual magnitude of 9.7 and is approximately 7,100 light years distant from the solar system. 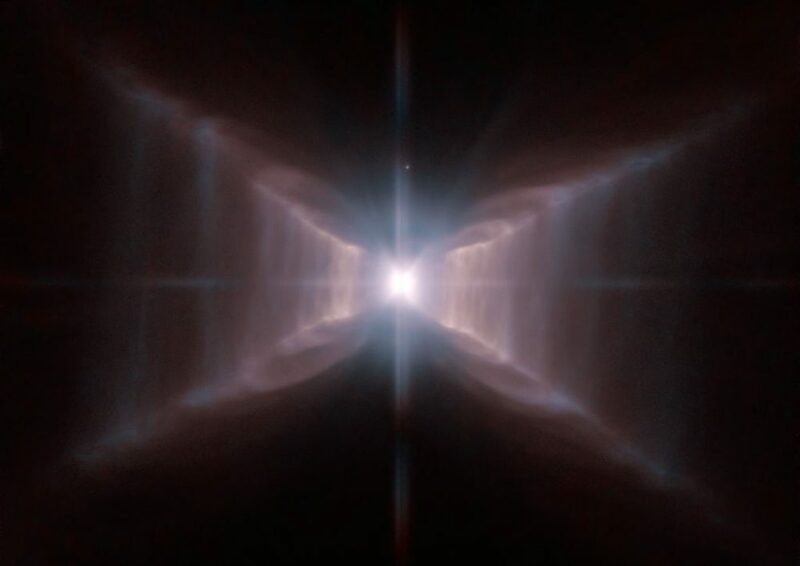 The Red Rectangle Nebula is a protoplanetary nebula in Monoceros. It was discovered in 1973. The binary star system at the centre of the nebula was first observed by the American astronomer Robert Grant Aitken in 1915. The nebula has an apparent magnitude of 9.02 and is approximately 2,300 light years distant from Earth. 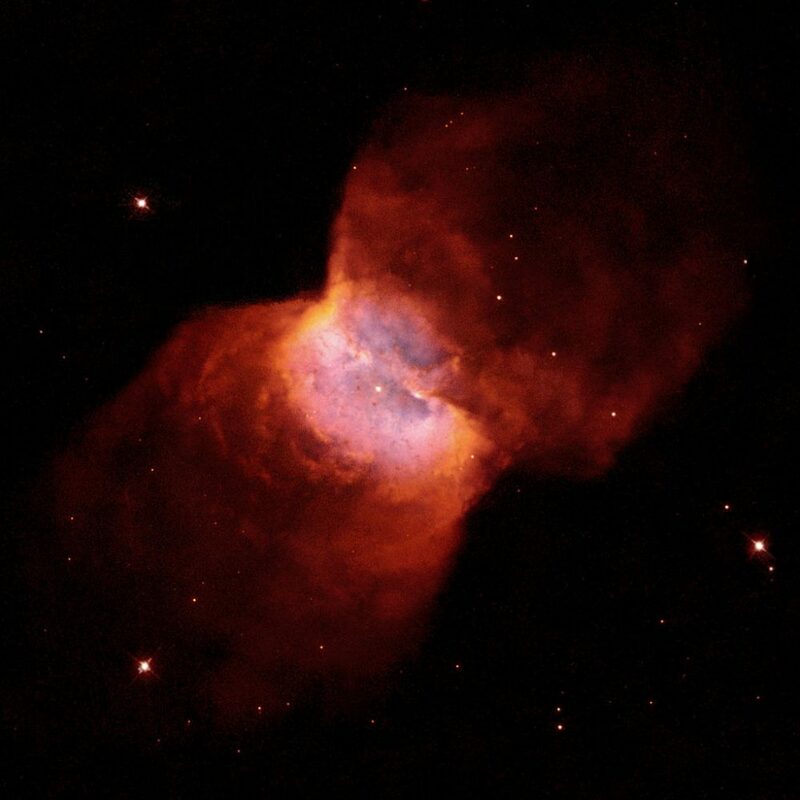 It is a compact bipolar nebula and it envelops the binary star completely, obscuring its light. When the cool star at the centre evolves into a hot white dwarf in the next few thousand years, HD 44179 will become a planetary nebula. NGC 2349 is another open cluster in Monoceros. It was discovered by the German-British astronomer Caroline Herschel on March 4, 1783. The Butterfly Nebula is a planetary nebula with an apparent magnitude of 11.6. It is approximately 2,000 light years distant. The central star is a spectroscopic binary with a period of about 16 days. It is a variable star, probably as a result of having dust in orbit around it. NGC 2170 is a reflection nebula in Monoceros. It was discovered by William Herschel on October 16, 1784. 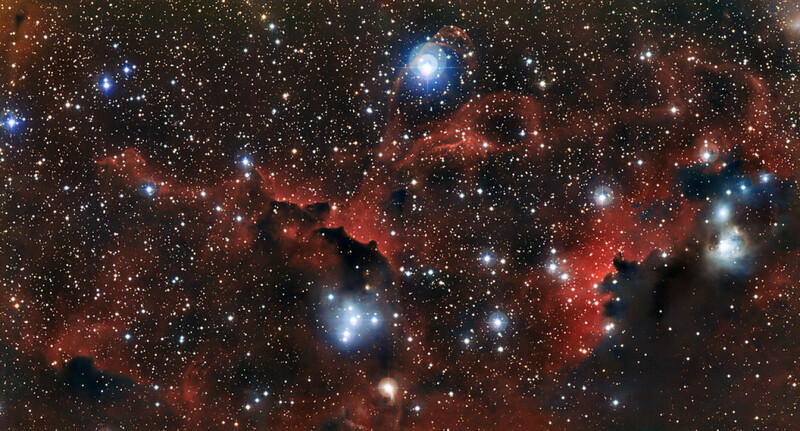 NGC 2232 is an open cluster containing about 20 stars. It is a relatively bright cluster, with an apparent magnitude of 3.9. NGC 2232 is approximately 1,305 light years distant from Earth. NGC 2506 is another open cluster. It was discovered by William Herschel in 1791. The cluster has an apparent magnitude of 7.6 and is approximately 11,300 light years distant from the Sun. IC 447 is a large reflection nebula in Monoceros, about 25 arc minutes in diameter. IC 2177 is an emission nebula in Monoceros. It is about 3,650 light years distant from Earth. The nebula is located on the border between Monoceros and Canis Major constellation. It is an H2 region centred on the star HD 53367. IC 2177 was discovered by the Welsh amateur astronomer Isaac Roberts. The nebula is sometimes known as the Seagull Nebula.